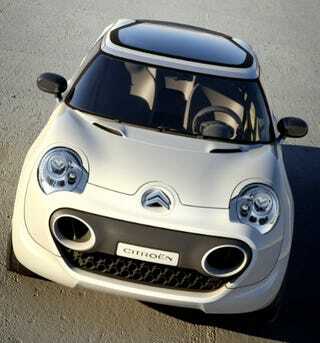 Citroën's entry in the Frankfurt auto show conceptual derby is a high-style, environmentally sensitive compact the company would sell at the same price as its C4 model. As Citroën notes in a press release, keeping down costs while emphasizing style and technology is a complex equation made square in the C-Cactus concept by stripping out all of the prototype's non-essential parts — like the dashboard. In its place, functions have been grouped on a computer touch screen on the center console and at the steering wheel's fixed hub. They've also reduced the number of build-parts and mechanisms to an extreme degree. The part used for the front bumper and headlamp assembly, for example, is the same part comprising the lower piece of the tailgate. The C-Cactus is powered by a hybrid-diesel powertrain — with a top speed capped at 93 mph — and its constructed from a large quantity of recyclable parts. Will high style and environmental conscientious become the new measure of high performance? Will art critics replace zero-to-60 timing? Will the car business be split in half by these seemingly irreconcilable points of view? Maybe Frankfurt will erupt in Chicago '68 style mayhem. We'll bring our flack jackets. At the same time, a number of monoblock units are used for C-Cactus to reduce the overall number of parts. The door panels, for example, are made of two parts, compared with twelve in a conventional hatchback. The seats also comprise two parts: a highly comfortable, moulded, coloured, integral-skin foam part for the seat, and a solid monoblock frame to hold the foam in place and fix the seat to the floor rails. The ergonomics are excellent and - here again - the number of components is limited. With its diesel hybrid drivetrain combining a 70 bhp DIN HDi diesel engine with a particulate filter and an electric motor providing additional power of 30 bhp DIN, C Cactus consumes just 3.4l/100 km with CO2 emission levels of 78 g/km over a combined cycle. In urban use, ZEV (Zero Emission Vehicle) mode provides silent, all-electric operation. On journeys involving successive acceleration and deceleration, the hybrid system limits fuel consumption by using both types of energy. Fewer parts also means smaller quantities of raw materials. In addition, a significant part of the materials used are recycled or recyclable. The windscreen and windows, for example, are made of recyclable glass. The tyres are also recyclable, as is the crude steel used for the door panels. This metal is unpainted and unvarnished but has been treated for corrosion. At the front, the headlamps of C-Cactus give the vehicle an appealing air with their rounded and slightly angular forms. They are underlined by two cylindrical air intakes cut out of the bumper, above an air intake grille of modern design which, while contributing to the vehicle's rounded forms, also adds a muscular energetic touch. The raised bonnet and two air intakes also contribute to the dynamic looks of C Cactus. The high waistline and 21-inch wheels also underline the strong character of C Cactus. The wheels were the focus of particular attention. Large-diameter wheels and low-profile tyres have become key styling features in vehicles of strong, contemporary design. The same flower, plant and butterfly patterns - symbolising the environment, purity and well-being - are also found on several other cabin features. They are cut out, for example, in the white lacquer seat frame. These cut-outs show the coloured foam used for the seat cushions and give it a decorative quality.